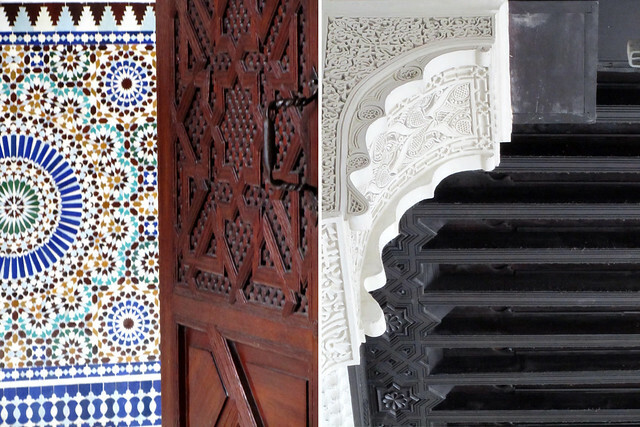 Built in Hispanic-Moorish (Mudéjar) style of architecture, what caught my eyes most on the somber February afternoon when we visited the mosque was the stunningly beautiful and colourful zellige adorning its walls. 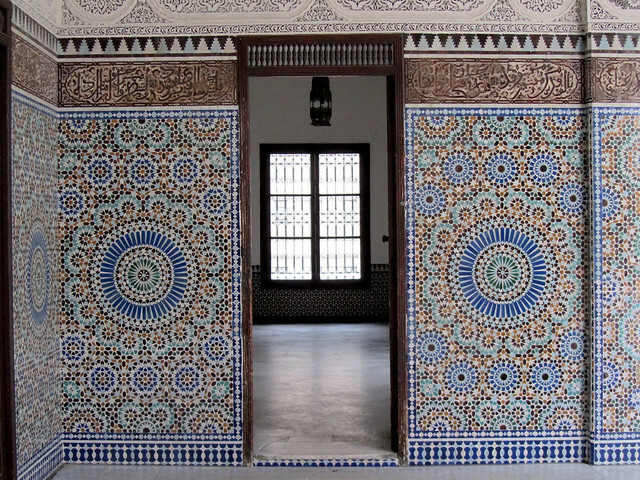 The intricately-patterned tiles had been meticulously built to capture everyone’s attention. Its inner court garden was quiet and peaceful, and I can imagine, once recovers from the wintry chill, the burst of life among the plants and greeneries would add additional layer of allure to keep its visitors enthralled. Our guide also brought our attention to the minimal use of Islamic text as part of the decorative characteristic of the mosque. 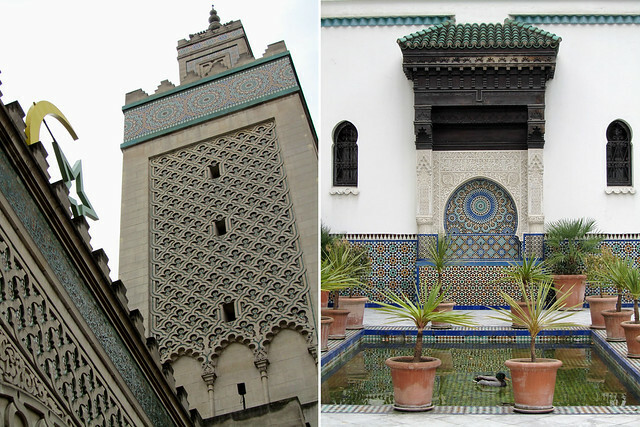 Instead, nature-based motifs (stars, leaves etc) and geometrical patterns have been made the more prominent features. The colour scheme is also composed of shades commonly found in our day-to-day life. Gree, blue and earth in harmonious complements. As one door to the prayer hall was left opened, we even got a peek at the pillar-supported vast room, with carpet in green with motif that also doubles as marker of a worshipper’s space on the floor, pale white/beige walls, iron-cast chandeliers (now holding electric bulbs) and wooden panels along the lower-half of the walls. It certainly was fascinating to uncover another facet of the mosque which I had no prior knowledge on. Growing up in an officially Islamic country, I understand the basic premise of the religion but without access to mosque compound, I remained ignorant to certain set up within a mosque. I wouldn’t pretend that I have now seen it all though. This is merely the start of another route of learning and discovery. The Grand Mosque of Paris is open daily, except Friday and religious days, from 9am to noon and 2pm to 6pm, to non-Muslim visitors. 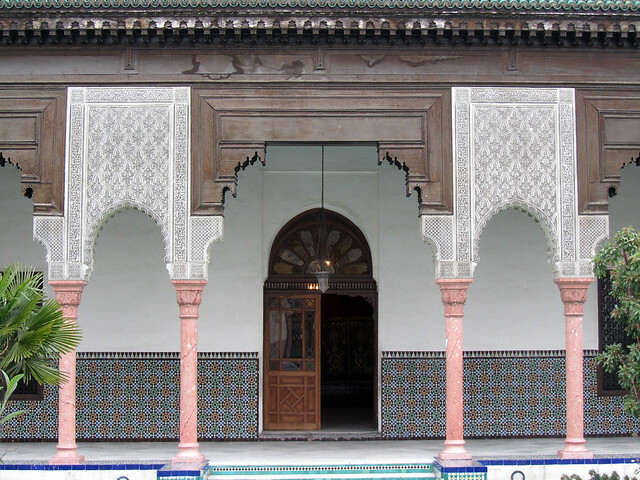 There is a small entry fee charged (€3 / €2 concession) and short, relatively informal guided tours are given free in French around the inner court, garden and library, while the prayer hall, certain rooms and minaret remains out of bound for those not of faith. Worshippers, however, may enter freely and without restriction to prayer areas. There are also tearoom/restaurant and hammam attached to the mosque complex but at a separate (and easier to spot) entrance that sits on the busy rue Geoffroy-St-Hilaire. The tearoom is just the place for a syrupy cup of mint tea and some sweet treats, and it links to dining area where couscous and tajine can be had. The hammam is gender-segregated, opens daily with specific days dedicated either to men (Tuesday and Sunday) or to women (Monday, Wednesday-Saturday). Thanks for a very interesting post! I never even thought of visiting a mosque but the Grand Mosquee looks fascinating. 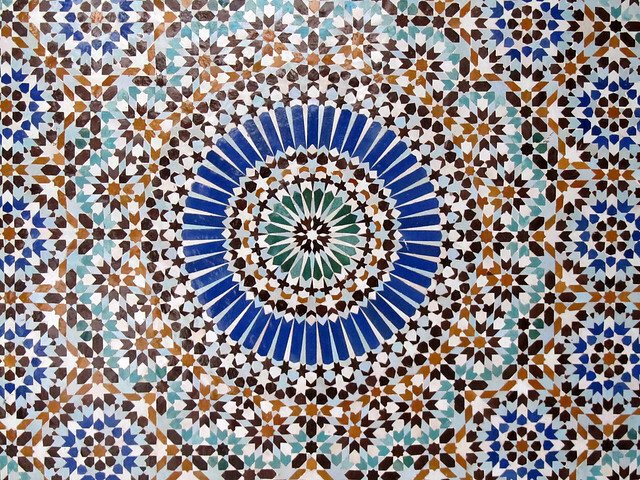 I love the geometric patterns, great inspiration for craft work. Lovely photos! Enjoy your stay in Paris. thanks gioia – i live here now so i intend to enjoy it as much as i could! i loved it and it really helped for my project enjoy your new lifestyle in paris!!!!!!!!!! Thanks! Hope all goes well for your project.